Okay gang- huge apologies. I have been a “slacker blogger” recently- and for that I am sorry. But, it is summertime and there are just too many other things to do! And, I admit, I have been less chatty here because I have to save every iota of wittiness and humor for my daily letter to my boy at camp. Now I have to ask, have you tried to write a real letter recently? Not an email mind you, but a real honest to goodness letter using pen, paper, envelopes, stamps and, if you’re really good, complete sentences. It is really hard. Now, do it every day for a month. UGH! So, forgive me…my silence has been for a very good cause. Speaking of which- camp appears to be a huge success- WAHOO! I am thrilled. There is nothing worse than sending your child off for a long period into the unknown. (Okay, I admit that a great boys’ camp in Maine is hardly the wilds of the jungle…but work with me!) Anyhow, we have gotten a few, very short-which I hear is a good thing-letters letting us know that he is alive, apparently happy, and now licensed to use a knife on the Ranger Trail. So, I can be happy too. Sadly, he does not ever write enough to help me with my letters to him so he has to hear about the dog’s haircut, his sister’s summer reading game, her swimming, my cooking, in short, all the daily drivel I can muster. Now that you are glad you are not receiving a hand written letter from me regaling you with all the minutia of the day- let’s talk cooking. As you know, I often get my inspiration for my kitchen exploits from the weather outside. Well, it has been very hot, thick and humid here and it has reminded me of the weather in Hong Kong in the summer. A good friend, who actually lives in Hong Kong, tells me that this weather is NOTHING compared to HK…but, still I can’t help but think of our summer trip there every time I step outside. Anyway, all this heat and humidity has me on an Asian cooking spree. Over the weekend, Tad and I tried a new dish that I fell in love with- two days later! What I mean by that is that this was good the first night- but it was absolutely awesome 48 hours later when I pulled it out and had it for lunch. And, I don’t know about you, but to have a light entrée or perfect side that gets better with age, just thrills me to no end. Shrimp and Noodle Salad with Grapefruit and Peanuts is just such a dish. It is a wonderful side (you could skip the shrimp if you wanted to, but I would not) and would be perfect with grilled steak and a green salad. Similarly, it is a great lunch entrée. I think that on it’s own, it is a bit light for a dinner entrée- but pair it with a delicious cold soup and now you’re talking! 2. Soak the rice noodles in hot- but not boiling- water for 10- 20 minutes until soft. Meanwhile, set a large pot of water to boil. 3. Trim the stalk of the lemongrass, and peel off enough layers to expose the tender core. Finely mince enough of the core to make 1 tablespoon. 4. Mix together the grapefruit, 1/3 c peanuts, the tomato, scallions, mint, 1/3 c cilantro and lemongrass in a large bowl. 5. Drain the soaking noodles and plunge them into the boiling water. When the water returns to a boil, drain the noodles and rinse them in two or three changes of cold water. Drain well and then toss in the bowl with the grapefruit mixture and dressing. 6. Brush the shrimp with the peanut oil and sauté or grill them for 2 minutes a side or until done. Season them with salt and pepper and place the shrimp on top of the noodles. 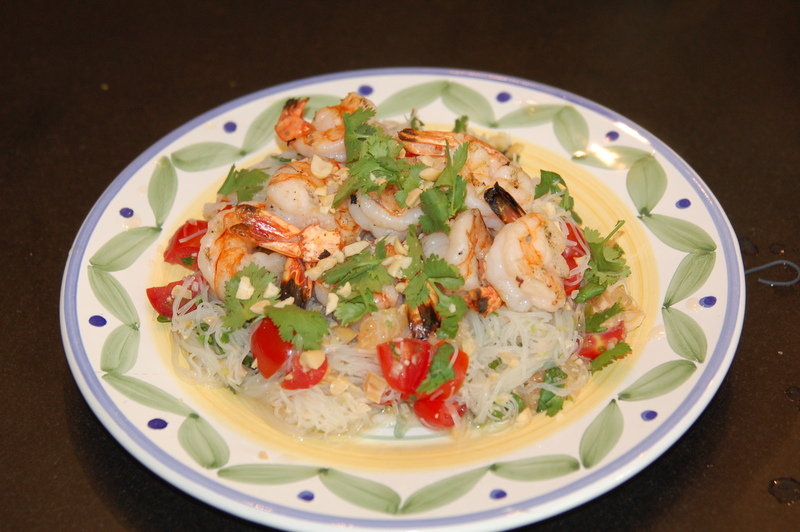 Garnish with remaining cilantro and shrimp. This entry was written by Caroline, posted on July 15, 2010 at 4:33 pm, filed under cooking, light, lunch, seafood, sides. Bookmark the permalink. Follow any comments here with the RSS feed for this post. Post a comment or leave a trackback: Trackback URL.